Last time I compared the journalistic profession with the shoemaker’s, my friends laughed. No obvious connection, except progressive obsoleteness. At least in some places of Europe, it feels like that. Try to trace a shoemaker in Rome. Nowadays, people just buy new shoes. In some cities, a shoemaker is a forgotten profession or someone that you rarely need in your everyday life. Now, ask a young journalist in the South of Europe what’s his/her living out of journalism. Do I feel as a journalist respected in my community for what I do? Do my compatriots value journalists’ work? To put it starkly, depreciation is the word. According to a survey, an overwhelming 96,74% of Greek citizens believe that Greek journalists are “manipulated”, which is alarming as for the quality of information the Greeks believe to be receiving. During my travels in Europe, I often hear the same complaints in other societies as well. Confidence from the audience, follows another pitfall and peril: scarcity of private funding for news business. The how-do-you-plan-to-make-money question from an investor, is hopelessly confusing today. In terms of resources, state funded media are a totally different story. Funding is there with an obvious source of income, immune to “life after advertising”, an evolution that wrecked the old models of monetization (mostly for private media). Though nothing is sure. Those too, hear the financial music and the digital tsunami didn’t leave them untouchable. They can not opt out of the changes of the future. Transformation is a forced move. In the same time, topics about political life in Europe are becoming abundant. What to cover first? The refugee crisis? The financial crisis? 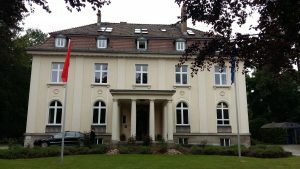 The rise of nationalist politicians in Europe or a potential Brexit? Suddenly we all talk more about Europe in everyday life. Topics from other EU countries or how policies and decisions on a European level are taken, have increased in number along with the no obvious narrative frame to explain the many tension between a monetary union without a fiscal, how work the mechanisms of European bail out, who decides on what on political level etc. Our journalistic work is flourishing in… those interesting times. 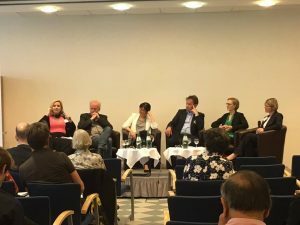 On May, 11th to 12th, Info Radio Berlin “rbb” and the European Academy of Berlin organized an international expert meeting in the German capital. After all, Europe is experiencing its most serious crisis, radio too. I was invited in the conference as part of the cafebabel family and it was a super chance to listen and exchange views, realize among fellows where we are standing. The emphasis was on radio and as most of the invited speakers were experts on waves in the air, they can definitely sense too, the changes in the air of their industry. The first panel struggled with the questions that naturally arise: What role do traditional news broadcasts still play nowadays? How can they help in conveying contexts in European policy and strengthening cohesion in Europe? How do those in charge see their role? What else does a news broadcaster need to provide in addition in its program? What stories does an all-news format need to tell – and first and foremost: how? Jonathan Wall, the head of BBC 5 Live, made clear that no one holds a crystal ball as to what will happen in the future with BBC. Every 10 years, the British government comes back on the question “and now, what I am I going to do with you”. It seems that the political leadership is not favorable at keeping BBC public but in the same time, British taxpayers appreciate and highly value the public broadcaster’s work and stance. “We have a job to do for everyone in the UK”, notes Jonathan. 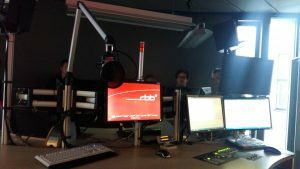 Nina Glans, the programme Director of P1 Sveriges Radio, our Scandinavian colleague from Sweden, brought an air of optimism: “The FM radio could live forever, I am optimistic.’ However, if this gentle breeze will spread in the rest of Europe, is not sure yet. 1. Is allowing the very best of our content to be in all platforms. 2. Connecting with more audience that is more fond of digital. I challenged Jonathan with a quote from the last BBC report for the future of news: “The voice of God is no good to the people who are not believers in news.” Do you think if we hold a referendum tomorrow (popular notion in UK nowadays) to keep the broadcaster public, the taxpayers would choose empathy and companionship over a reduced home bill? Jonathan is clear, the answer was given so far from the British citizens; even though the government would potentially close BBC, Brits have decided they want BBC to stay as it is. I am not so confident for the answer of my Greek compatriots who experienced a sudden public broadcaster’s shut down, when the government closed ERT, on June 2013. As of 11 June 2015, ERT started broadcasting again. Till then, both decisions sparked a debate in the society on whether we want a state – funded broadcaster with 2,656 employees for a country of 11 millions. Let’s take a look at what’s happening at the other side of the Atlantic from where trends are coming. The Media Insight Project in the USA reveals that millenials wouldn’t like to pay for the news as they consider their right to be informed. What do they have in mind, paying a paywall? A subscription or a small tax of few dollars per month? 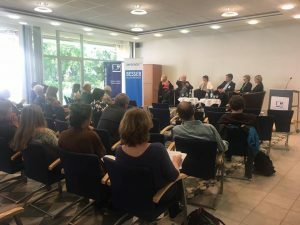 Back in the Berlin conference, the second panel debated on listeners’ expectations of a modern news radio station: How can the audience be integrated into the programme so that they ‘stick at it’? What opportunities and pitfalls are arising from increasing digitalization? Can, or should, a news radio station be a ‘social’ medium too? Is this a way to interest listeners in Europe? I had a slight objection over this argument and I said it loud. For this report, I will not write my own words but I will quote Megan Garber’s excellent article, “Personalized brand: Yet another reason the Economist is trouncing competitors”. 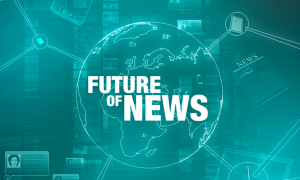 Megan Garber writes: “This is what we tend to forget when we talk about journalism’s evolution: the news brand, in the past – for all its exclusivity, for all its anonymity- was much more than a brand […] it was also an identity. It was a purchased proxy for a personal worldview. A subscription to the Times even a newsstand purchase of the Times, meant something both public and, even more importantly, intimate. The news brand was, in its way, an externalized self, a reflection –often aspirational- of the way its consumers took part in the tumult of human events […] what we share on Twitter, what we comment on Facebook – that is new the proxy for identity.” In other words, we “friend” and “follow” as we read in the past the articles of specific authors, of our favorite publications. Antoine Bayet, the young director of numerical information at France Info, is trying to pour some new wine into the wineskins. While he is trying to switch from radio a 30-year-old brand to global media, he used an expression we rarely hear from European media executives: “We decided to have an aggressive strategy to the internet. We want to connect to a live product. My job is to make radio to go on digital”. Those are fine words and one can only wish him well. On the paragraph “an unrepresentative media”, Benton takes a look at the profile of the average journalist in the USA: “Journalists don’t like it when conservatives point out that they, as a group, lean farther left than the country as a whole. But you don’t need to be a conspiracy theorist to believe it: College-educated liberal arts grads who live in cities — a group most American journalists fit into — are more liberal as a group than the American median. And those who live in New York or San Francisco are going to be more liberal as a group than those in Cincinnati or Knoxville. Now let’s think what’s the situation in Europe. The problem is not necessarily the geographical concentration but the fact that journalists have a specific social profile. I am better placed to speak about journalists in Greece, who cherry pick what to cover in terms of politics and parties, or more accurately, choose the political parties that will not report on or even interview their representatives. I have even heard from friends working for the public media that are not allowed to invite in panels, members of the nationalist parties while those parties are elected in the Parliament. Since when journalists decided to be the judges of society? Is this really the role of journalists? These choices make us loose something from reality and while journalists pontificate on what or who is good and who is evil, in the same time, they lose the confidence of people. Easy question: What is the role of foreign (?) correspondents today in EU? I have an issue with correspondents. I am not sure we need them for this role within Europe. Simply put: Correspondents correspond to the media organization they work for and not to the local public. They have a unilateral relationship with their office back home or the central bureau. Is this kind of coverage enough to put things into perspective for life in Europe on 2016? Is the job of the Associated Press (American wire service) correspondent based in Madrid the same with the task of the Spiegel correspondent in Athens? Practically, yes. But what if Spiegel (randomly chosen media) had a regular office in Athens in order to curate and produce news for the local audience? Wouldn’t this facilitate the complexity of the European debates (and tensions)? Would that help more our national audiences to understand the other societies? Wojciech Szymanski, the Berlin Correspondent for Polskie Radio, explained how while covering the refugee crisis, transmitted back home information on how the German citizens reacted to the presence of refugees at the German ground. He acknowledged that the Polish society is not so “progressive” facing immigrants in Poland and that Polish do not understand the German reaction. I wonder what would be the added value for the audience if this information was placed into context. For instance how Polish citizens massively migrated in other European countries during the wars. At this point, I will come to the question of “impact”. Is it important today, just to transmit facts? To be a newsgatherer mostly on what politicians say and do? What about the context? The debates other European societies face? Are correspondents the missing link for a genuine European coverage? What is the difference between a Reuters (Canadian owned wire service) correspondent and a correspondent of a European media organization that is reporting for a European problem that affect us all in Europe? The context on the refugee crisis press coverage, was absent from most publications and correspondent stories I read. I did read about the heartbreaking stories in the Greek islands or the Balkan route, but, despite the blame game politicians started on who is responsible, there was a sound absence on the context. On what was going on until summer 2015, the tensions between Greece (the European door) and Turkey, the heruclean task to control 13.676 kilometers of coastline (half the size of the entire African continent) while public service has to fire people due to bail out agreements with the IMF and the EU. Political leaders did play the blame game but do correspondents fact check reality? What about European political public opinion? Obviously, I support the creation of European media organizations (not Italian, nor German, or French etc, but European). Entities that will function more as networks than centralized entities with correspondents. This approach requires a change of self – conception as a publisher and organization. The reason is simple: it’s not that I support a political pro-European stance (is not part of my job as a journalist). But look what’s happening. We have same EU laws for the free movement of people, goods and capitals. Aren’t we better off synchronizing our reporting? Let’s put aside the refugee crisis, do you remember scandals with meat that traveled in different countries. Wouldn’t be more effective to report in a more European conscious way? That is a familiar ground for me. And my personal bet with European publishers. Most of them are of a certain (older) age, in mind and body. And they do not believe in this sort of venture. Familiar for them is national. What about one European and not fragmented audience? 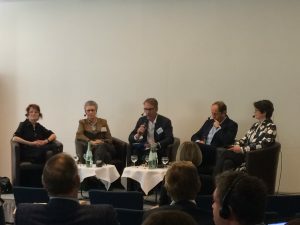 In the panel we were together with Isabell Hoffmann, project manager for “The Future of Europe“ study at Bertelsmann Stiftung, the biggest private foundation in Germany. “European citizens are not the unknown factor in this process. The political elites are the unknown factor. The message sent out by European citizens is loud and clear. They want efficient European solutions. They want the EU to be responsible for these solutions. They want to keep the Schengen area and freedom of movement. They want common protection for the common border. And they are not afraid of the consequences of joint action. Few minutes before the panel discussion starts, a young woman approaches me, (I later learnt, as she stepped with me in the panel, that she was a deputy at the German Bundestag), and asks me: “Do you know Adriano. How is he?”. Franziska Brantner, 15 years ago, was α roommate in Paris with the Italian inspirator and cofounder of cafebabel.com, Adriano Farano. Needless to mention that during the discussion, Franziska was very enthusiastic about the prospects of common European reporting. Few days later, I get to meet in Athens Jeremy Caplan, the director of education for the Tow-Knight Center for Entrepreneurial Journalism in New York. 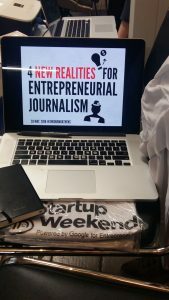 During his presentation about US entrepreneurial journalism, among the projects he presented, was Adriano’s new venture in the United States. When I asked him, what he thinks we do wrong in Europe and we innovate less in journalism, fist thing he mentioned was the European tradition of state funded media. Then again, when one thinks the reporting during the European crisis, of the biggest private media powerhouse in Europe, Axel Springer, through its most profitable asset, a tabloid, can be devastating. Despite the company’s technological lust for progress, the numerous insults, the self-appointed judging of other societies and the political manipulation of the masses, could resemble to the Medieval judging. On the other hand, we saw the epitome of sense making from public media, ZDF, where through an allegoric, theatrical piece, the show presenters posed the right questions, the ones that politicians avoid or worse, trick the citizens. It is an example of how a mass media can make us all think and become smarter citizens. The European Academy of Berlin, is situated in West Berlin, where all the lakes are. At the end of Kurfurstendamm avenue, you make a turn in the street, no more shops. The scenery is beautiful, silent, with fairytale houses with big gardens, tall trees and occasionally some statues. 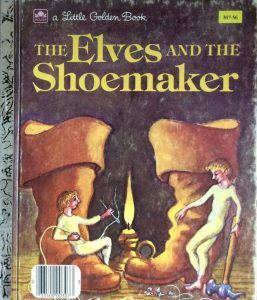 Hopefully, next time, the elves from the fairy tale “the Elves and the shoemaker”, will make their appearance, work their magic to save us, and provide the much-needed help to the troubled shoemakers. “The voice of God is no good to people who are not believers in the news. If we are going to serve everybody — if we are going to ensure that the people who are switching off the news tune back in — then we are going to need different people, telling different stories in different ways,” the report says. A collaboration between the American Press Institute and the Associated Press-NORC Center for Public Affairs Research. In eupinions #2016/01 Bertelsman Foundation interviewed 11,410 European citizens in all parts of the EU. The survey was conducted in December 2015.